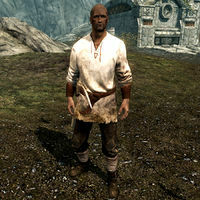 Pavo Attius, an Imperial miner, can initially be found at the Left Hand Mine and will give you the quest Kolskeggr Mine. Once the quest is completed he will move to the mine and will buy gold ore for 50 gold each. He wears a set of miner's clothes and a pair of boots, and is equipped with a pickaxe. He carries a key to the miner's barracks, a key to Pavo's house, and a selection of lower-class loot and gold. Upon raising his disposition, he will become a potential candidate for marriage. He can initially be found outside of Left Hand Mine with fellow miner and survivor, Gat gro-Shargakh, and waits there with Gat and Skaggi Scar-Face. When the town disperses he heads with Gat to the Miner's Barracks where he then stays twenty-four hours a day. When the mines are reopened, he heads back to Kolskeggr to get to work. He now wakes up at 8am and immediately heads to the mines and works for twelve hours. At 8pm he heads back to his house and relaxes for four hours. Then finally at midnight, he heads to bed. When you find him standing outside Markarth feeling sorry for himself, you may hear him passing remarks such as "Kolskeggr Mine is lost, friend. Forsworn killed everyone. ", "Don't go to Kolskeggr. It's not safe." and "Gat and I are the only survivors." You can ask Pavo if Left Hand Mine is his, to which he will say, "Skaggi is in charge, not me." The same question can be asked when he has returned to Kolskeggr, "That it is. Good to be home. Let me know if you dig up any ore. We'll pay a fair wage." If you ask him if he is from Kolskeggr, he will reply by saying, "Was. Forsworn came in the night. Killed everyone. Gat and I are the only ones who escaped. Hopefully Skaggi will send word to the Jarl and something will be done." If you tell him that's too bad, Pavo will say "You're telling me. ", if you instead offer your help, Pavo will be skeptical and say "I'd be grateful. Kolskeggr is my home. But, I wouldn't go there if I were you. There's a whole group of them with axes and magic on their side. You'd never stand a chance." When you have taken back the mine he will be amazed and remark "You drove them off? By yourself? Thank you! We'll head back to work, right away. Take this, it's the least I can do." Once you have finished his quest you may mine ore for him any time you want. He announces this by saying "Good to see you again, friend! We've opened the mine back up. If you're here for work, I'll buy any ore you have." He will entice you to do this by telling you that "Mining is hard work, but we pay a fair price for any ore you dig up." At other times he can be heard saying "I never thought I'd see Kolskeggr again." and "The mine is just how I remember it." Gat: "Well I'm glad you were there. I don't know how I would have gotten past the Forsworn without you." Pavo: "Are you all right, Gat?" Gat: "Still shaken from all the fighting, my friend. It's been too long since I had to kill someone." Pavo: "Thank the Divines we survived that." Gat: "Those Forsworn were fierce fighters. Fiercer than I could have imagined." Gat: "I feel like we're mining even more ore than before." Pavo: "It's the rush of good fortune, my friend. It makes you work harder." Pavo: "Are you worried the Forsworn might return?" Gat: "I doubt the Forsworn would risk holding this mine a second time. They lost many of their warriors." Pavo: "Do you remember the Legion? Fighting the Thalmor in the Great War?" Gat: "There were many good battles, friend. I miss those days." Pavo: "You miss them? I don't know how many times I feared for my life." Gat: "You didn't die. A battle you live through is a great honor." Pavo: "Did you ever want to return to your stronghold? Go back to your family?" Gat: "I would need to challenge the chief, and take his head, to return home. I'd rather stay here." Pavo: "Don't tell me you, of all people, are afraid of a battle." Gat: "If you had to kill your own brother to be allowed back home, you'd think twice as well." After completing Pavo's quest, he may die while walking to Kolskeggr Mine. The Forsworn at Kolskeggr Mine respawn, most likely resulting in the deaths of Pavo and Gat. This page was last modified on 26 August 2018, at 00:29.